Last year we told you everything about Alan Sugar. This year we are going to introduce his American counterpart, Donald Trump, who you maybe know thanks to his distinctive haircut. Donald Trump was born in New-York City in 1946. He was the fourth of five children of Fred and Mary Anne Trump. He went to the University of Pennsylvania and afterwards he joined his father’s company, the Trump Organization, a real estate business. In the early seventies he started his career with the renovation of the Commodore Hotel and continued with the Trump Tower in New York City. Later on he developed other projects, among which the construction of casinos and the growth of a business airline industry. However, from the nineties onwards, he had to face financial difficulties. Due to the effects of recession and bad investments he was indeed unable to meet loan payments. By 1994 he could pay back his $900 million personal debt and his $3,5 billion business debt. In the late nineties and the noughties he became successful again. For instance, in 2001 the construction of the Trump World Tower was finished. Other projects include many buildings (Trump International Hotels and Towers, a Nike Store, etc. ), golf courses and the creation of famous beaches. He was not spared by the financial crisis, which he described as “an Act of God”. He eventually resigned from the board of his society, which is now led by his son, Donald Trump Jr. This does not prevent him from still having $1,6 billion on his bank account. 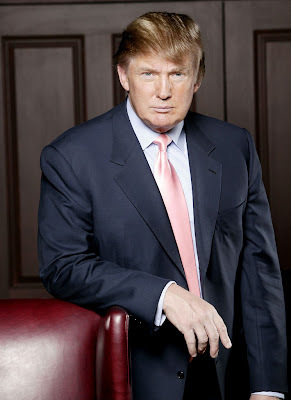 Donald Trump can be considered as a media personality for several reasons. First and foremost he is the executive producer of “The Apprentice”, a reality show on the NBC in which candidates try to be employed by Donald Trump. He also shares with the same channel the production of Miss Universe and Miss USA. Furthermore he is the author of fourteen bestsellers. His first book, "The Art of the Deal", is a business classic. The Trump name is also to be found on many products: a university, restaurants, ice cream, a travel website, clothes, a fragrance, bottled water, magazines, a brand of vodka and even steaks and vitamins. This self-made man also managed to seduce models. He has already been married with Ivana Zelnickova, with whom he got three children, then Marla Maples, who gave him one child and last but not least, the young Melania Knauss, who gave birth to a boy. His first wife gave him the nickname “The Donald”, which was picked up by the media. During his free time Donald Trump enjoys golfing and wrestling. All this perhaps explains the fact that Donald Trump has his own star on the Hollywood Walk of Fame.